Mulling a new selfie stick for your travels? Here are some helpful tips to ensure that you get the right one for you. Like mad anglers fishing for the perfect shot, selfie stick users have gone forth and multiplied around the world. Heck, if we ever go to Mars, I’m sure someone is going to pop up there with a selfie stick, too. If you’re angling to join the selfie-verse, there are a few things to think about when picking your own personal smartphone stick. Here’s a list of considerations to help get you on the right track. Lots of folks tend to focus on the “stick” part of the selfie stick when mulling their options. One of the important pieces of any selfie stick, however, is the cradle attachment that houses the phone. If you use a smaller device, then you’ll be good to go in general. If you have a larger smartphone such as the new iPhone 6 line, the Samsung Galaxy Note Edge or even an odd-shaped duck such as the LG G Flex 2, however, you might find that the clamp might not be sizable enough to hold your device. This is especially true of older selfie sticks that were released before ginormous phones became the new standard. As such, make sure the clamp is large enough to accommodate your device of choice. Speaking of selfie stick cradles, not all clamps are created equal. When looking at clamping mechanisms, you’ll want to think about ease of use and security. The two most common styles I’ve seen on the market involve either a pull-away wire clamp or an extending plastic grip with fasteners. The metal wire grip has the advantage of being quick and easy to set up but grip can be a bit iffy if you bump it into something or subject it to sudden, strong movement. The extending plastic clamp can take a bit longer to fasten but once it’s locked in, it should be pretty secure. When choosing the latter, make sure its edges have good “bite” so to speak as I’ve seen some with loose grips that pretty much defeat the purpose of such a clamping mechanism. Everyone loves a versatile gadget. Although most folks use selfie sticks with their smartphones, they can be a useful accessory for small cameras and video cams as well. If you’re interested in using your stick with a device such as the rugged JVC Everio Quad-Proof camera or even a GoPro, for example, you’ll want to get one that comes with a camera mount option as well. This usually involves a fat screw that can attach to the bottom of any regular camera. While we’re on this subject, I also recommend getting a stick that comes with a good ball joint for either the camera mount or even the smartphone cradle. This gives you plenty of options for positioning when you’re out and about. Just make sure you watch out for cheap swivels that don’t work as well or break easily. Obviously, it’s great to have a selfie stick with enough length to get as much of those panoramic sights in view. But length is just part of the equation. 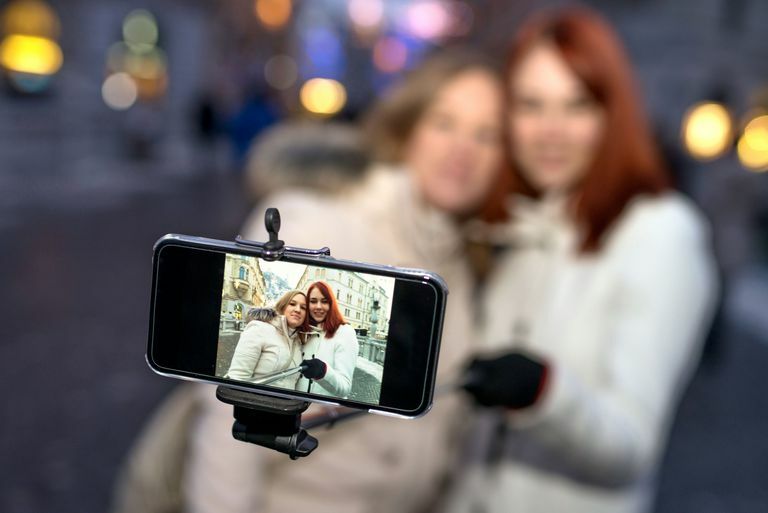 Portability is important for selfie sticks as well so you’ll want to get one that shortens adequately for ease of carrying when traveling or walking around. While we’re on this subject, take note of the extension mechanism as well. Some sticks such as the iStabilizer Monopod, for example, feature a simple, stiffer mechanism akin to an old car antenna. Then you’ve got other options like the Satechi Bluetooth Smart Selfie Arm, which have a looser extension mechanism but comes with a lock to keep it in place once extended to the ideal length. Although you can program your smartphone to use a shutter timer before taking a picture, a remote trigger is more convenient for taking lots of images with your selfie stick. For basic sticks, you can get a separate remote that allows you to remotely trigger your smartphone’s camera (same with some dedicated still and video cameras as well). Some sticks such as the aforementioned Satechi, however, come with a smartphone-compatible remote that that lets you trigger a shot straight from the handle. If you prioritize quality of images, well, you’d get a DSLR. Seriously, though, we’re talking about phones here and as far as the devices go, the rear camera is usually way better than the front camera that people normally use when taking selfies. If you want to use the rear camera but still see your phone display for proper framing, some sticks also come with a mirror option or attachment that reflects your phone’s display. Consider one of those if you want the best pics from your smartphone while using a selfie stick.